Flying drones is such an awesome hobby and racing them is even more fun. If you’re thinking about taking your drone flying to the next level, consider a new kind of drone. If you’re looking for the best RTF racing drones, look no further! We researched some of the top brands and best-rated DRL drones for sale to put together this review. Before we get to it, let’s take a look at some of the top features you need to know. Range - The range is how far the drone can fly from the control. It’s pretty important because if your drone goes out of range, you won’t be able to control it anymore. And you definitely don’t want that. 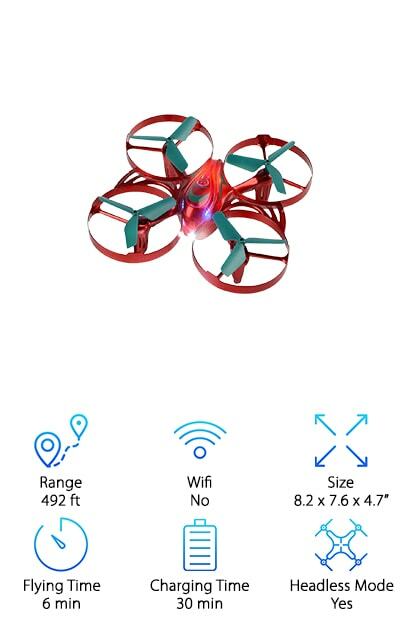 WiFi - This is one place where racing style drones differ from other drones. 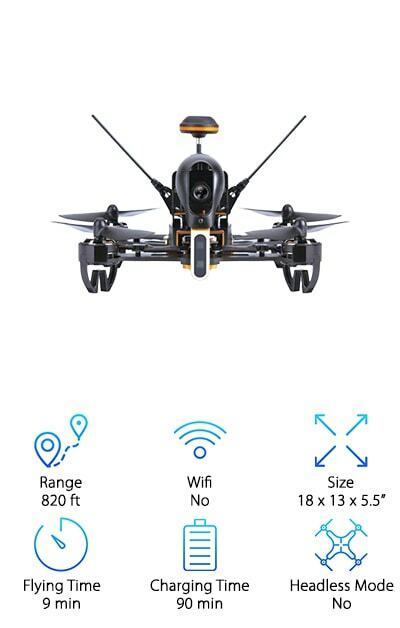 While other drones use WiFi to connect to your smartphone, take photos, or even use it as a remote, none of the racing drones we reviewed have WiFi. Size - The thing that is the most inconsistent about the drones we reviewed is the size. The range is so wide! Some of them are quite large while others are about half the size. Get whatever size makes you happy. Flying Time - This varies a little between each drone, too, ranging anywhere from 5 to 12 minutes. There is one outlier that we have to point out - it has a really impressive flying time of 18 minutes! Charging Time - Drones typically take a pretty long time to charge. These ones range from 30 to 90 minutes. Again, we have to point out that the drone that flies the longest has the longest charging time - 240 minutes. Headless Mode - This is a feature that lets the pilot control the drone without having to worry about which way the drone is facing. Instead, the drone will orient itself to the remote which makes it easy to steer. Now that you know more about drones from our racing drone buying guide, let’s move right into our racing drone reviews. Are you in a hurry? If you don’t have time to stick around to the end of our list, make sure to check out our top and budget picks. They’re the first 2 items on our list so they’re really easy to find. Stick around if you can, all of our picks are great. Ok, let’s go! Here’s our top pick for RTF racing drones: the Tokky Brushless Racing Drone. 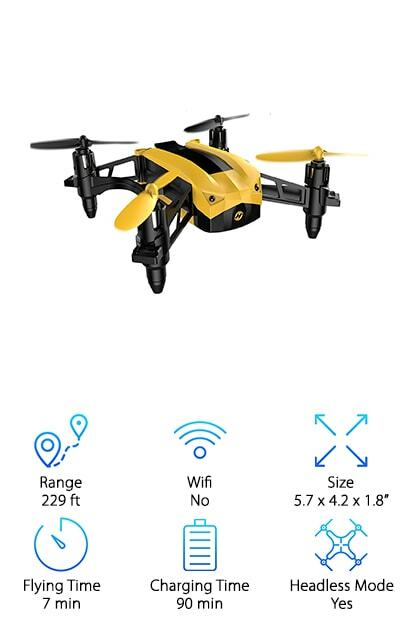 This is an extremely durable drone that’s energy efficient and takes full advantage of the brushless motor. What does that mean? A brushless motor keeps the friction low between the moving parts. This generates less heat so the engine and battery last longer. Something we really liked about this drone is it comes with a backpack so it’s easy to transport and store. And get this: it includes a high capacity battery that lasts up to 18 minutes! 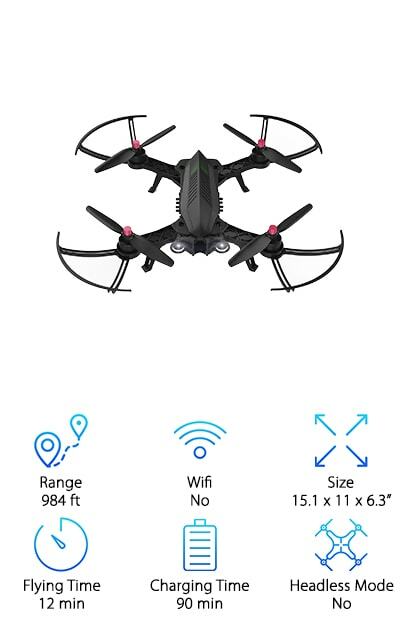 That’s a long time for a drone this size. There’s a camera slot where you can add your own GoPro, too. It also has a beginner and advanced mode so it’s a good choice for anyone. The best RTF racing drone for the money is the Holy Stone Bolt Bee Racing Drone. It’s a great choice for users of any level. Listen to this: it has 5 different speed modes! Simply adjust the throttle on the remote control and you can get up to 31 mph. Another great feature this drone has is headless mode. This means that the drone orients itself to you instead of you having to orient yourself to the drone. It makes steering and navigating really easy, especially for beginners. Another great thing about it is it comes with 2 batteries. You’ll always have a spare so you can fly twice as long. That’s not all. It does 3D rolls and flips. Plus, it flies extremely fast. One of the best drones for racing it this awesome quadcopter from Coolmade. 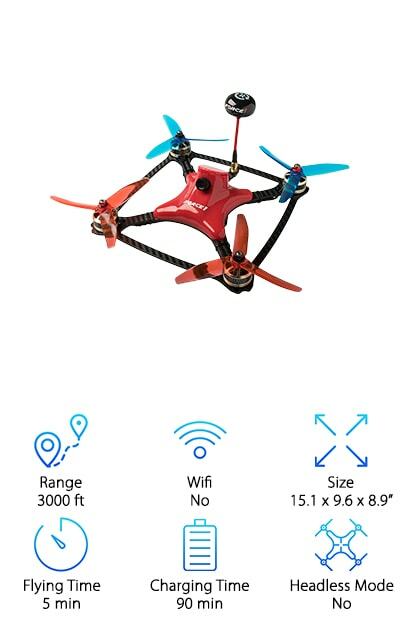 It has 3 speeds so it’s a good choice for beginners and experienced pilots. Something we really like about it is the front LED light that makes night flying a little easier and even more awesome. 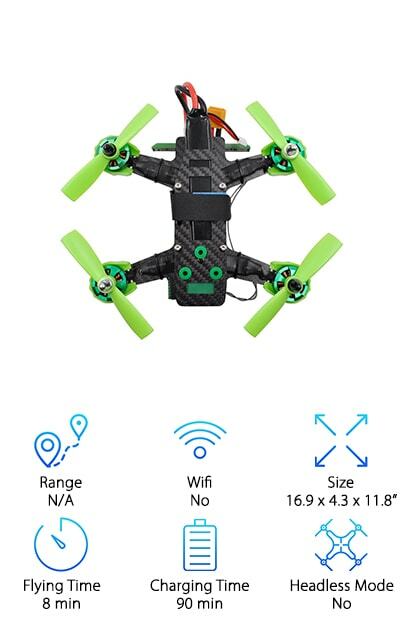 The design of this drone is interesting is the frame that protects the propellers from all sides. That’s not all. One of the coolest things about this drone is that it has hand launching. What’s so cool about that? You just throw it into the air and it starts flying. It also has altitude hold that keeps it at the same height. It can do 360 degree flips, too. And get this: it has a 12-month warranty. If you’re thinking about getting into drone racing, the DROCON Bugs 6 is one of the best racing type drones around. Its brushless motor gives it more power for a little more speed than a regular drone. Something that’s super cool about this drone is the remote controller. What good about it? It has a weak signal alert and a low voltage alert. 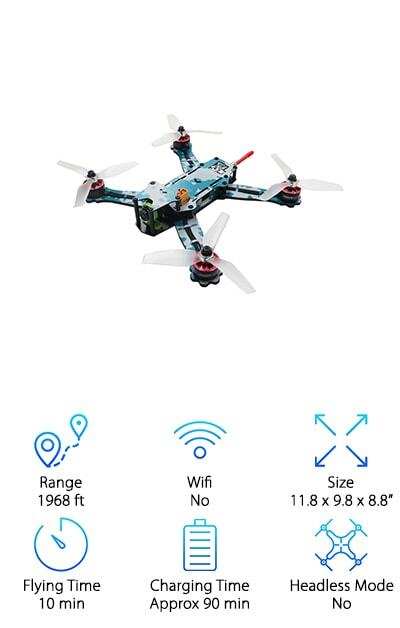 There’s an indicator light and an alarm that let you monitor the drone’s signal strength and how much battery power is left. This will help you get the drone back to you before it gets out of range or runs out of power. One more thing: you can get a camera for this one that’s really easy to attach and get some really awesome footage. We’re calling the Force 1 DYS the best racing drone for a lot of reasons. First of all, it comes in a really awesome kit that includes an HD camera, FPV goggles, charger, and case. The frame is one of the best features of this drone. It’s lightweight, super durable, and won’t bend. The HD camera is integrated right in the frame which helps keep it lightweight since you don’t have to worry about attaching an actual camera. Put on the high-quality goggles and you get to see real-time video transmission right from the drone. There’s one more thing you should know about this drone: it’s built for racing. You can get high speeds without worrying about it damaging the motor. The Walkera FPVs are super fun ready to fly racing drones that are packed full of awesome features. One of the good things about this drone is that the frame is really tough. The carbon fiber construction is perfect because it’s durable and lightweight. It has a lot of power, too, and is super-fast. And get this. There’s an amazing camera on this drone. It’s HD and capable of night vision. Think about it: you’re going to get some amazing footage. Plus, the real time image transmission that lets you see clear shots of where you’re racing. This is one of the most fun drones to fly. It’s fast, durable, and the view you get from the camera will make it easier to keep a close eye on the competition. When looking at ready to fly drones, you have to check out the ARRIS C250 V2 RTF Racing Drone. It comes pre-assembled and ready to fly. One of the big advantages of this drone that makes it such a good racer is the frame. The design is simple, strong, and really lightweight, too. The camera is built right into the body of the drone and is pretty sweet. The angle is adjustable so you’ll be able to catch everything going on around you. You can fly this one right out of the box so it’s good for beginners. For those with a little more experience, you can really tweak it a bit. Overall, this is a fest drone that handles really well. 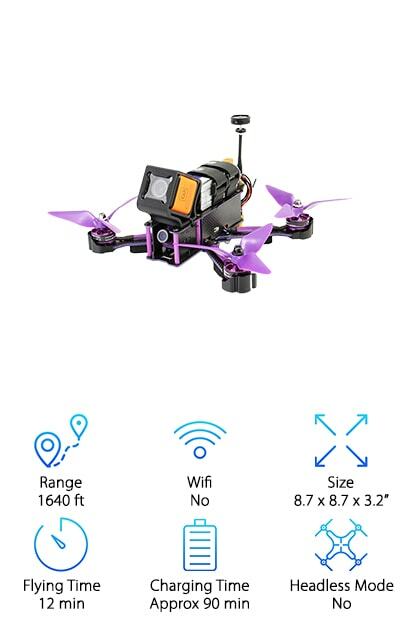 Another great DRL racing drone for sale comes from EACHINE. The Wizard Racer has an awesome design that is light, strong, and pretty flexible. 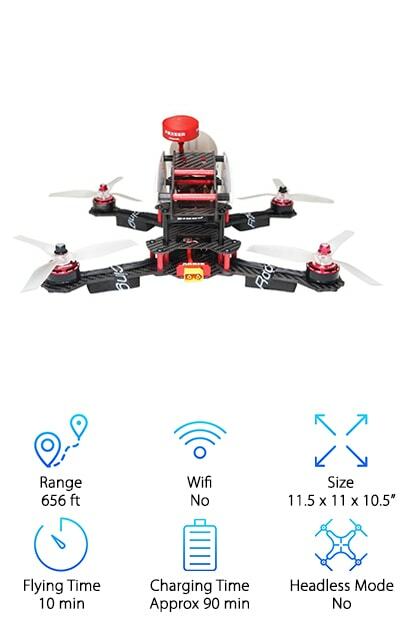 This is a fun drone to fly because it has a lot of maneuverability and power. It doesn’t have anything more than what it needs to win. Plus, the weight distribution is done really well which helps it stay really stable in the air. The propellers have 3 blades which give a little more stability and control than one with 2 blades. One thing that we really like about this one is it’s ready to fly right out of the box. But, if you ever want to modify it as you gain more experience, it’s really easy to do. The FlySky FPV Racing Drone is one of the racing drones for sale that we just knew we had to include on our list. It’s ready to go right out of the box and has been pre-calibrated. The remote is pretty great, too, because it lets you adjust some of the flight parameters really easily. When you get it, make sure the battery is fully charged and the drone will be ready to hit some seriously fast speeds. Guess what else. There’s a camera, too. You can easily adjust the angle so you’ll be able to find the view you’re looking for. 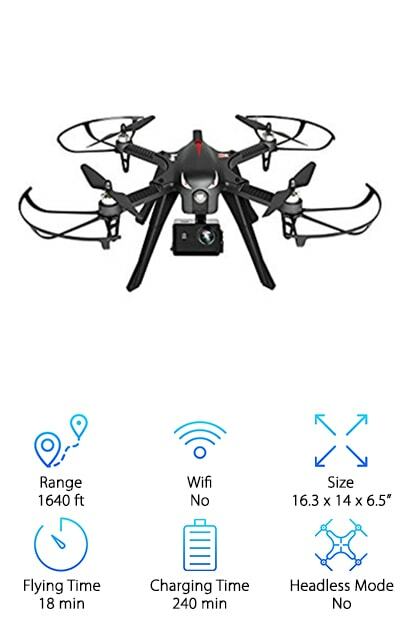 If you have some experience with drones and want the freedom to make some upgrades, this is a good choice for you. There are a lot of really cool things about the ARRIS X-Speed Racing Drone and we knew we had to include it in our top ten reviews. One really nice thing is that it’s ready to fly. It comes fully assembled and, get this, it’s tuned in the factory before it gets to you. That’s really nice because it’s one less thing you have to worry about. The Raptor 390 Tower is a great feature as well. It keeps the wiring nice and neat so you don’t have a big mess on your hands. The frame has a simple structure which makes it easy to repair should anything happen. That’s less likely, though, thanks to the thick 3mm arms and strong, durable frame.